Introduction: A sequence either in the form of a sentence or in number forms is given. This is called the INPUT. This INPUT is followed by a number of steps. In these steps, the input is arranged in different ways. You being the candidate is required to trace out the ways or patterns in the given arrangement and then determine the desired output step, according to as is asked in the questions. This is followed by about 5 question based on several different inputs and needed to be solved using the logic applied in the given input. Now, let’s talk about the logic applied in the above example. When you keenly observe the above input and the steps, with each progressing step the words are arranged in the ascending order of the first letter of the word. The word is just shifted forward and the rest of the sequence remains same and so on. This shifting is called OPERATION. 1. Shifting – In this pattern, we usually shift the given words or numbers of given input as per fixed pattern. 2. Arranging – In this pattern, the words or numbers are arranged as per a fixed order. This order can be an alphabetical order in case of words, increasing or decreasing in case of numbers. 4. Miscellaneous – As the name suggests, the combination of any operations. The input can be anything and the machine can perform a set of random operations on it. A few tips to identify the type of operation. Tip – 1: If the input and the subsequent steps involve the same words (or numbers) then it is most likely to be a problem of either shifting or arrangement. Else if the words (or numbers) change in subsequent steps it is a problem of arithmetical operation or miscellaneous type. Tip -2: If either the first or the last word (or number) of all the steps (excluding input) remains unchanged then it is (almost) certain that it is an arrangement problem. Now let us see if you can identify the type of operation. If you got all of them right means you are getting it. Now let’s dig the topic a little deeper. Shall we! When you have determined that the operation in the question is shifting and the shifting of letters, rather than playing with alphabets which is a tad complicated, number the alphabets in the input and continue with the numbers which makes the task a little easy. And so on goes the machine. Study the logic and answer the questions that follow. But as in the above example ther, is no mention of the last step and the input consists of alphabets only, the options for operation being ARRANGEMENT and ARITHMETIC are eliminated, Thus leaving us with SHIFTING operation. If step 13 of a given input be “blut ne fur sur say trep dawn”, what is the 17th step of the input? Just a little practice and you will get a hang of it. Step 2: red are in software bourses scrips hot. And so on. As per the rule followed in the above steps, answer the following questions. Q 2: If step 4 of an input is “none of the players have turned India”, what would be step 9? What will be the 4th step for this input? Q 4: If step 5 of an input is “none of this has happened at all”, what will definitely be the input? Q 5: If step 1 of an input is “in this form of trading by amway”, what would be step 7 of the input? For given input Step 5 is the last step. Solution: As we discussed before, the mention of last step in the question indicates that the operation used on input must be ARRANGEMENT. When we observe the question closely, the numbers are arranged in a descending order step by step. The biggest number in the series is pulled forward, then the second largest and so on. Thus giving us the list sorted in decreasing order at last. Now let’s move to the questions based on arrangement mentioned above. Which of the following will be step 5 for the given input? In the above diagram, rather than writing the entire step, we just draw a curved line from the number that needs to be accessed to the front of the line and give them a number to indicate the step number, as we know the final arrangement to be descending. You must be wondering that before arranging 23, number 25 must be shifted forward. You are right absolutely, but as 25 is already in front which means has been automatically set to the place it needs to be, thus hinting us to leave it and work on the next number, which in this case is 23. This is also the case with number 8 which comes in the front where it needs to be thus saving us a step. In arrangement problems, the contents of an earlier step can never be determined with certainty. Let’s work with another example to perfect this trick. And Step 5 is the last step for this input. Observing the last step, the words are arranged in alphabetical order based on the first letter step by step. Which of the following will be step 2 for the given input? ace all am if is (which is option no 4). Which of the following steps would be – are at fault on you this? Which step will be the last step for this input? These are a few practice questions for arrangement based on above logic. Moving forward, up until now, all the inputs we saw had either numbers or alphabets. What if the input was a combination of both alphabets and numbers? Why not take an example to understand it clearly! Step 6 is the last step for the above input. Answer the following questions based on the above rearrangement. 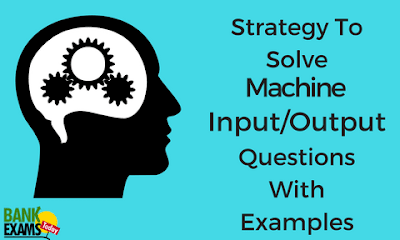 Solution: When we observe the input, it consists of both numbers and words. Having observed the input, final step has the input arranged in “word number word number” format that too following the ascending order for both words(according to first alphabet) and number. When we jump from input to step 1, only one element (either word or number) is arranged which means one step processes on only one element. Let us now move forward to the questions. What will be the Step 5? Which saves us the trouble of writing the entire word coz as I always say “Sahi question karne se jyada important hai sahi time me sahi question karna”. Which is option no 2, thus the answer. Let us now solve one more question based on above operation. Solution: Let us now take the input and a pen for the curved lines. Always remember when the next element to be worked on is already in front of the line, it means it is already arranged and doesn’t require moving. Skip that step and move on to next element. Also to save some valuable seconds, you can use just the first letter of the word. Don’t forget to use more than one alphabet if two words in the series have same first alphabet. As “t” is next element to be worked on but is in front, therefore no step required. Similarly, 49 is the next element which follows “t” thus setting it automatically at the desired position. Therefore, total number of steps required is 6, which is option no 4. What will be the input if the fourth step of the arrangement is? What will be the Step 3 for the input? Moving forward, up until now in all the questions, each step shifted just one element in the series. What if, one step works on more than one element! Step 5 is the last step of the rearrangement. As per the rules followed in above steps, find out in each step of the following questions the appropriate steps for the given input. As you can see, in the above arrangement question, after every step position of two elements gets changed. Observing the last step closely, we can conclude that the words are arranged in descending order from left to right and so are the numbers. In the first step, the word with the smallest first alphabet is shifted to the first position simultaneously the largest number is shifted to the last position. The words arranged in the first step shifts to rightward direction in the next step, while the numbers are shifted to leftward direction. Now let us proceed to the questions based on the arrangement and the provided input. I have replaced the words with only their first letter. You also need to keep in mind the final arrangement which means the last step. Which word/number would be at 8th position from the right in step 4? Solution: Now, as know that in every step two elements get arranged one word to the left side and one number to the right side and with each progressing step, the get shifted inwards. In the question, we are asked about an element from right side in step 4 this means there are total 4 numbers totally arranged from right side occupying 4 positions. As the elements are shifted inwards, the numbers initially at the right hand corner keep moving inside. Now, observe closely, we already have 4 numbers arranged; we are trying to figure out elements at the 5th position from right side. Last number 46 in the input got arranged in step 4. Next element in the input is 38 which gets arranged in step 5 and so occupies the 5th position from right in the step 4. Next element “s” which is short for “stop” is arranged in step 7 and so its position remains unchanged in step 4 and takes 6th position from right. The next two elements “b” as in “bus” and 73 were arranged in step 2 and are already at their desired positions. Next from right is “h” which is “hut” was arranged in step 4 and so is at desired position. Moving forward, the next element is 15 which is arranged in step 7th and so remains unchanged in step 4 making it 7th element from right in step 4. Next element “r” short for “road” is arranged in step 6, leaving it unchanged in step 4 and makes 8th element from right which is also the element for us to determine. And so the answer to the question “8th element from right in step 4” is “road”, which is option no. 2. Solution: As we can see two elements from the left and also two from the right are at the positions as required in the output, thus making it step 2. But before marking your answer, do check the positions of all the other elements other than the two leftmost and rightmost ones. The positions of all the other elements must be unchanged and should be the same as was in the input. Having checked that, mark the answer. In this case, the position of all the other elements is appropriate thus making option 3 which is step 2, out answer. Which of the following would be step 7? Which word or number would be at 6th position from the left in Step 5? Which of the following would be Step 3? I am gonna say it again, tad bit of practice and machine input output questions will be your forte. Try a few questions using tricks mentioned above and save some valuable seconds in the exam which you can utilize letter to add another precious mark in your score.